Preheat the oven to 180ºC fan oven/200ºC/gas 6. Grease 2 baking trays. Cream the butter and sugar together. Add the egg yolks and the vanilla. Mix well. Stir in the orange zest and then the flour. Mix to a stiff dough. Make about 20 small balls and place them on the trays. Give them a squash down. Place in the oven for 12 minutes until slightly browned. Once cooled, mix the icing sugar and enough orange juice together to make a fairly stiff icing. 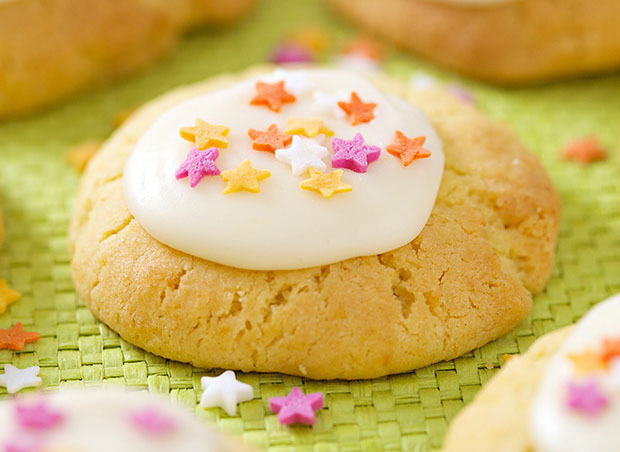 Put a blob on each cookie and then shake over with a few sprinkles.